We all can agree that there are secrets best kept by government from the public for a multitude of reasons. For one thing, we will all agree that issues affecting national security, such as secret weapons, tactics to be used in the event of attack on our shores, etc., must be given protection from our enemies who could use that information to our detriment. There are incidents in our history, such as the full investigation into who killed John F. Kennedy which arguably, if they contain sensitive information, could fall into that category that the public is best not given the full and true picture. However, I am not sure about total secrecy on such issues as whether we have aliens from another planet amidst us should be kept secret, but after several viewings of Men in Black and learning that some very famous people on the planet may well be amongst that non-human species, I can understand why facts about UFOs could be validly withheld from general knowledge. But when it comes to facts about our infrastructure and the potentially perilous conditions of our bridges, roads, dams and electric grid I have gained too much information as a result of authoring “Too Big to Fall: America’s Failing Infrastructure and the Way Forward” to allow any claim by government that withholding such information from the public is a good thing. So this recent article authored by a very respected journalist identifies the spurious efforts of the New Jersey Transit folks to disclose information on which rail bridges may be in critical need of attention has brought this issue to the forefront. I wish to share my concern with each of you. "NJ Transit is in possession of documents containing information which, if disclosed, would jeopardize the safety and security of NJ Transit bridges," the denial letter said. A further request to the NJ Attorney General’s office got a similar refusal and the statement that the documents "contain sensitive technical...information regarding the structural integrity of nearly six hundred bridges" maintained by the agency. Think about that: although New Jersey has hundreds, if not thousands of the nation’s approximately 55,000 structurally deficient bridges and these are widely known to the general public who seek this information, learning which rail bridges are in danger of collapse, bridges that carry a million passengers a year, is a secret only to be shared by those with Top Secret clearances. When Curtis spoke with me for his article I pointed out that on the fifth anniversary of the collapse on August 1, 2007 of the I-35W in Minneapolis which killed 13 people and injured another 145, I published a Google map at www.SaveOurBridges.com that permitted every citizen who entered a zip code to see all the structurally deficient\fracture critical bridges (those in danger of imminent collapse) in that area. This website has been quoted publicly on many of the TV and radio stations with whom I have interviewed over the past ten years AND NO GOVERNMENTAL AUTHORITY HAS EVER ASKED ME TO TAKE IT DOWN for any reason, let alone national security reasons. Why then, I asked, could any transportation agency seek to preclude this acknowledgement of pending disaster from the questioning press or the public whom it serves? We truly deserve better from our public officials. I hope that journalists such as Curtis Tate continue that fight. I hope he convinces his publishers to take this battle to court as an affront to our first amendment rights. And I hope that one day, the sunlight of transparency will shine brightly on our state and federal government leaders who, for the past four decades, have failed to exhibit the political will and the political leadership to make repairs to our imperiled infrastructure a primary mission before further disasters occur. I hope we all win that ultimate victory. As always, please let me have your thoughts and ideas in response to this issue. 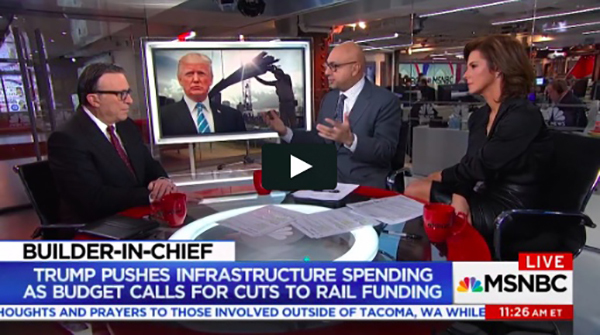 Following the recent derailment of an Amtrak commuter train north of Seattle, the producers of MSNBC reached out to me and asked me to join Ali Velshi and Stephanie Ruhle to discuss this disaster and the subject of our nation’s infrastructure. The five minute interview is shown by clicking on the image above. MSNBC has highlighted the interview by citing my statement that the soon to be revealed Trump infrastructure plan is “dead on arrival”. I believe there will be little likelihood that the members of Congress can support a plan to improve our perilous infrastructure by adding $200 billion more to the nation’s deficit which just experienced an increase in the national debt of $1.5 trillion from the newly-passed tax plan of the GOP. Moreover, the infrastructure plan is heavily weighted to require states to make up a large portion of the $800 billion to be raised by outside equity and state contributions. This would only be possible by increases in state taxes – taxes that are not always deductible by its citizens under the new tax law. Can Failing Infrastructure Be Bad For Your Health? Barry LePatner appeared on “The Stream” a live interview program put out to over 250 million households across the world by Aljazeera. Joining in on the discussion was a quite interesting group of knowledgeable participants including: Tom Smith, Executive Director, American Society of Civil Engineers, John Nichols, Author, "Horsemen of the Trumpocalypse” and Political correspondent, The Nation Magazine and Tanvi Misra, Staff writer, CityLab. The conversation addressed the state of the U.S. infrastructure and the prospects for remediating this troubled sector of our nation. Barry LePatner is interviewed on CNBC to discuss our nation's infrastructure in light of the failed dam in Orreville, CA. Barry LePatner was interviewed on CNBC by the four hosts of the daily business TV program, “Power Lunch" to discuss the state of our nation’s infrastructure and the news surrounding the failed dam in Orreville, California. The hosts were very savvy on the subject and most interested when he urged the need for an “infrastructure Czar” to break thru the morass of the logjam created by the US Congress for the past several decades. Mr. LePatner believes there remains substantial congressional logjams that will mitigate against the full onslaught of pushing through a comprehensive infrastructure program over the next few years. While we should remain hopeful, as this was a strong issue for President Trump, the hurdles his administration will face in trying to effect such a program will be substantial.